Followers of this blog have probably seen the new TV Spots for The Dark Knight Rises by now. 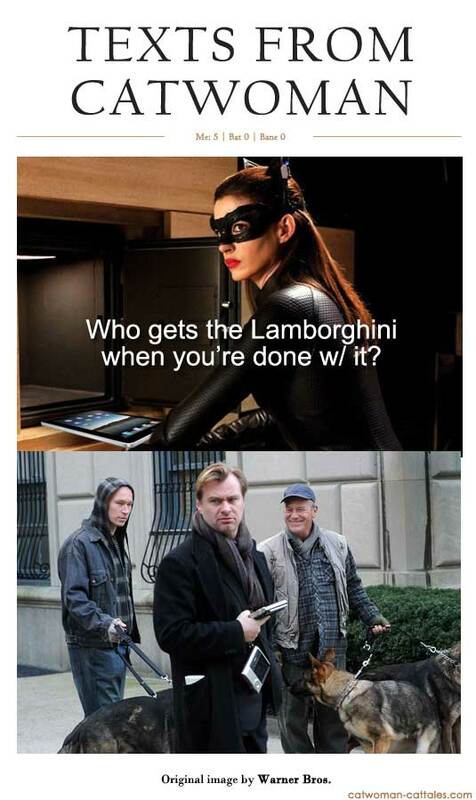 I decided to have a little fun with the fact that Selina seems to be stealing Bruce’s Lamborghini, which not only dovetails into all the fun I’ve had with a certain purple Lambo in Cat-Tales since it was introduced in Short Tales(has it really been that long? Yes, yes it has), it was also a reason to dust off and re-trumpet last month’s Texts from Catwoman fun. Remember this one? So did I, but when I went looking for it, I discovered something intriguing as I scrolled down the page. Posted in film | Tagged batman, christian bale, christopher nolan, texts from catwoman, the dark knight rises | Comments Off on Who are you pretending to be?